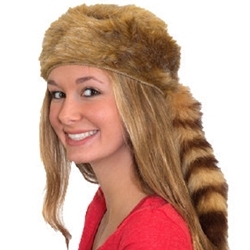 The Blonde Coonskin Hat is available in One Size Fits Most Adults. This classic hat style has been sported by the likes of Daniel Boone, Davy Crockett, Pioneers, Frontiersmen, and Fur Trappers. Directors often look to this hat for the Lost Boys of the show Peter Pan.